The CAC's product review test car, a 2012 ZO6 has about 49,000 miles on it. I like to flush the brakes every few years and a couple months ago, it was time. For over 20 years, when I've bled brakes in my little DIY shop, I've used a small, hand-pumped, pressure bleeder, but recently, it malfunctioned so I replaced it. 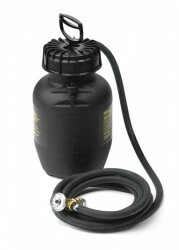 The one I selected is from Gear Wrench (PN 2901D).This bleeder holds about a gallon of brake fluid, comes with a six-foot hose which on one end, has pressure gauge, a fluid shut-off valve and a quick-disconnect coupler. The tank has a pressure vent valve on the top next to the filler cap. Start by bleeding the master cylinder. Next, have an assistant or use a brake pedal depressor to put pressure on the brake pedal. Then, crack open the front fitting on the master and let it drip for a second or so then retighten the fitting. Release the brake pedal wait a second or do then depress it again and crack open the rear fitting on the master and let is drip for a second. Retighten the fitting. The fist step in using the GearWrench bleeder is to install a brake bleeder adapter in place of the the master cylinder cap. Some of these are available from GrearWrench. If you use an adapter not made by GearWrench, such as the Kent-Moore J-35589A we use on the ZO6 and all of our other GM vehicles, you have to install an automotive (also known as a Truflate, Type T, or C-style) air line coupler to the adapter. The bleeder's quick disconnect goes onto the coupler on that adapter. Filling the pressure bleeder is as simple as unscrewing the top and pouring in several pints of brake fluid, in our case Red Line "RL-600". Several strokes of the GearWrench bleeder's pump has it pressurized to 25-30-psi, GM's recommended pressure for bleeding. Pumping it up requires no more effort than pumping up a bike tire. Next, you open the valve at the end of the bleeder hose. To flush the brakes on a C6, you start at the right rear brake caliper. Since these are Brembo fixed-caliper brakes, each brake has two bleed fittings and you must bleed each individually. Remove the fitting caps then do the inner-most fitting first then the outer. When you open the fitting, the fluid will start coming out a medium brown color. After you close the fitting, replace the rubber fitting cap. I bleed each fitting until the fluid turns light yellow, indicative of fresh fluid. Then do the left front, left-rear and finally the right-front. My new GearWrench brake bleeder works very well and is perfect for we DIY folks who are not bleeding brakes for a living and, thus, do not need a large, commercial-grade pressure bleeder. One feature the GearWrench bleeder has which my old one did not is the vent valve. I store the bleeder unpressurized. With my old bleeder, once I finished a bleeding session, I had to unscrew the top to release the pressure. It was always a challenge to unscrew the top slowly so the pressure would not release explosively. The GearWrench's vent valve makes venting pressure in the bleeder much easier. Bottom line: GearWrench's small brake bleeder is a must have tool for the CAC's DIY shop.